In photography, ISO is a rating of your camera sensor’s sensitivity to light. A lower ISO like 50 or 100 means that the sensor will require longer shutter speeds and larger apertures to properly expose an image. A higher ISO like 1600 or 3200 will require shorter shutter speeds and/or smaller apertures to properly expose an image. Auto ISO is a fantastic tool to use for birds in flight, sports and action photography. Oystercatcher, Iceland. Nikon D500, 200-500mm, f/5.6, 1/1000s, ISO 100. Almost all current interchangeable lens digital cameras give you the option to manually select an ISO value or to use a setting called Auto ISO. There are advantages to setting your ISO for a fixed value and there are advantages to allowing the camera to choose the ISO for you. For example, I generally use a fixed ISO when I have time to think about the exposure and in situations where I’m shooting from a tripod with fairly stable lighting conditions. Alternatively, I use Auto ISO when I’m shooting birds/wildlife, street photography or shooting outdoor sports where the subject might quickly move in and out of the light. Hiking with friends is a great situation to use Auto ISO. Here, we are hiking to a bird sanctuary in southern Iceland. Nikon D850, 14-24mm, f/6.3, 1/60s, ISO 100. In fast-moving situations, Auto ISO is a godsend that allows you to concentrate on composition and focus while the camera automates exposure. I think of Auto ISO as a tool that helps me respond quickly to the scene by cutting out additional mental tasks I have to accomplish before taking the picture. Your camera probably has a few Auto ISO options to choose from. In each case, you’ll most likely need to select the minimum ISO (starting point) and the maximum ISO you want the camera to use in order to meet your exposure criteria. Let me go through three of the most common Auto ISO settings to help you decide which one is best for your shooting scenario. Most entry-level cameras and point and shoot cameras have a standard Auto ISO option that doesn’t have any other customization options. This setting takes the ISO decisions out of your hands and allows the camera full control over ISO settings. Often times, the camera automatically chooses ISO and shutter speed based on its own internal algorithm. It does a pretty good job, but doesn’t allow you any ability to optimize settings for your specific subject. Here, my photographer friend and I were hiking up a steep incline photographing a waterfall in Iceland. I used Auto ISO to give me a fast enough shutter speed to prevent motion blur while hand-holding the camera with one hand. Nikon D850, 14-24mm, 1/80s, f/8, ISO 100. I’ll use this setting when I’m using a smaller entry-level camera and when traveling with my family. In these cases, I use the camera much more for grab-shots because I don’t have a lot of time to spend setting up compositions. This setting is found on mid-level and pro-level digital cameras. I recommend using this specific Auto ISO tool for sports, birds in flight, auto/motorcycle racing and any other activity where your goal is to freeze action. Here, you’ll choose a minimum shutter speed that want to shoot use for the image. Then, the camera’s exposure system will make sure ISO is high enough to allow that minimum shutter speed. For example, let’s say you are photographing birds. Most of the time, you’ll want a minimum shutter speed of at least 1/1000s in order to freeze the motion of the wings. Therefore, you’ll set your Auto ISO minimum shutter speed to 1/1000s. Any time the light begins to dim, the camera will increase ISO to meet your shutter speed setting. If you are using Aperture Priority, you’ll still be able to choose your aperture (i.e. f/5.6) while the camera then uses Auto ISO to make sure your shutter speed doesn’t fall below 1/1000s. I set up my Auto ISO settings for 1/1000 sec minimum shutter speed for this image. 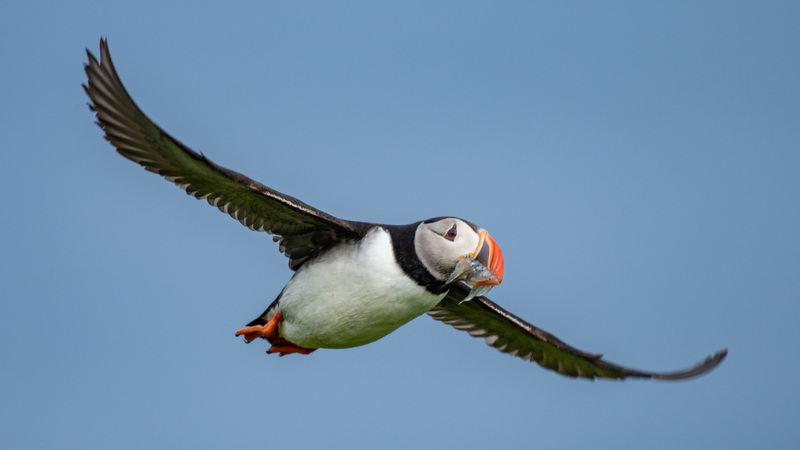 Atlantic puffin, Vestmannaeyar, Iceland. Nikon D500, 200-500mm, 1/1000s, f/5.6 ISO 160. Use this setting when hand-holding your camera. A common scenario is shooting street photography with a zoom lens. The concept here is that your shutter speed will change depending on the focal length of the lens. This harkens back to a traditional rule of thumb that a photographer should be able to hand-hold their camera and get a sharp image at shutter speed equal to 1/focal length. In other words, if you are shooting with a 24mm lens, then you should be able to hand-hold your camera and get a sharp image at about 1/25s. This option is sometimes confusing as it is called Auto ISO Auto. In this scenario, the camera chooses shutter speed based on lens focal length. This Auto ISO setting determines what focal length your lens is zoomed to, then sets the shutter speed according to that focal length. Keep in mind that if you are using a super-wide zoom lens, like a 10-20mm, then your shutter speeds will vary between 1/10s and 1/20s. These longer shutter speeds might cause moving objects to blur in the image. If you are holding your camera steady, then still objects should be sharp. I use Auto ISO Auto when I’m hand holding my camera and doing street photography. Harpa Building, Reykjavik, Iceland. Nikon D850, 14-24mm, f/4, 1/40s, ISO 100. For this shot of an Icelandic horse, I used Auto ISO Auto because I was hand-holding my camera and the horses weren’t moving. I wanted the camera to make sure my shutter speed would always be fast enough for my long 200-500mm lens. Nikon D850, 200-500mm, f/5.6, 1/320s, ISO 32. Again, I want to emphasize that this Auto ISO setting (Auto ISO Auto: Shutter speed based on focal length) is specifically designed for hand-holding your camera when shooting scenes that don’t move (buildings, landscapes, urban scenes, portraits). How will you apply Auto ISO? Now, my challenge to you is to go out and put Auto ISO to work for your shooting style. I encourage you to embrace the technology and use Auto ISO for sports, action, wildlife, travel, street and any situation where the action is moving quickly. I think you’ll love this setting! Let me know how you are using Auto ISO or if you have any questions in the comments below. I put my camera in manual mode, select ss and aperture and use auto iso fof the said situations. Mike for Africa and any wildlife I choose auto ISO and set the default to 100 ISO and 1/60 of a second and set the top end at 5,000 then I shoot manual so I can adjust my shutter speed for animals on the run and those just grazing or laying in the shade. I can also adjust my aperture to get the nose, eyes mane in focus F7 or whatever, and easily switch to landscape by adjusting both shutter and aperture. I have one question. If my histogram shows a wall climber I have used exposure compensation. So my question is, under auto ISO in manual, will exposure compensation work, or just make me feel good about trying to adjust?